Yes. Your mattress matters. But there is something else that matters more. Most of us are simply unaware of the role a mattress protector plays. We think we don’t need it – simply because we are adults and we don’t pee in bed. Or maybe because we think we are being upsold by the shopkeeper. But there are a number of reasons a mattress protector is one of the most important investments you will ever make. It keeps your mattress clean. It also keeps your mattress feeling like ‘new’ for a long time. It also prevents dust mite allergies. It…well, the reasons are endless. But then, which is the best mattress protector out there? Which one to go for? This article will put that confusion to rest. Here, we have compiled the names of the top 10 mattress protectors in India. The top surface of the protector is made of hypoallergenic terry cotton that absorbs moisture naturally and keeps the sleeper comfortable. The protector also comes with Airflow Technology, which promotes air circulation throughout the protector. This keeps the protector 100% waterproof, and helps repel liquids. It protects the mattress from dust mites, allergens, perspiration, and other fluids. 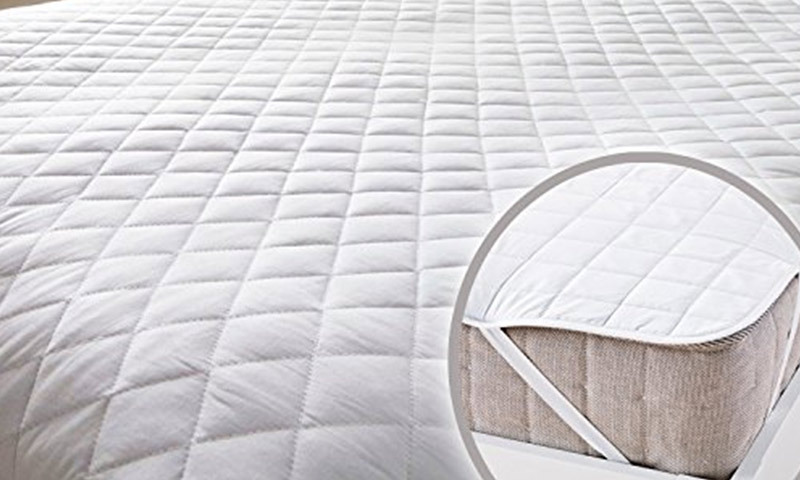 It is hypoallergenic – prevents allergens like pollen or dust mites from entering the mattress. The protector contains a TPU (thermoplastic polyurethane) layer that keeps it breathable and soft. It also comes with a terry cotton layer that keeps the surface cool. It absorbs the moisture and offers a comfortable sleeping experience. The mattress protector comes with advanced covering that offers protection from stains, spills, and moisture. It’s made of 100% terry cotton and has a water protection membrane. This mattress protector’s ideal for infants as it prevents bed wetting. This hypoallergenic mattress protector is especially useful for those with kids, bedridden elders, pets, and even those who are vulnerable to allergies. The protector is made of soft terry cotton fabric that makes it breathable and cool. This protector has a cotton terry surface with PVC membrane at the bottom that makes the mattress 100% waterproof. It also is hypoallergenic and protects from dust mites, fluids, and allergens. The mattress protector is made of poly cotton and is 100% waterproof. It is breathable, and contains a waterproof membrane through which it repels liquids. It offers protection against fluids, allergens, dust mites, urine, and perspiration. The mattress protector has a hypoallergenic Cotton Terry surface, which retains the mattress feel when you lay on it. It absorbs all the moisture and aids restful sleep. The mattress protector protects against dust mites, bacteria, and fluids. It’s made of cotton fabric, and has a ultra soft quilt atop that gives a comfortable feel when one sleeps on it. This protector traps dust mites, allergens, and dead skin cells on its surface – where they can be easily washed away during a laundry session. The protector also comes with a soft cotton terry surface, which absorbs moisture and enhances your sleep experience. The Desirica mattress protector is made of poly cotton and is 100% waterproof. It protects your mattress from any kind of liquid spills. The Mharo Rajasthan Waterproof mattress protector comes with elastic bands on all the four sides, which properly secure it on the mattress. The filling of the protector is made of polyfill fiber sheet (2 mm thickness), and hence has more room to absorb the dust or any other liquids. The protector is made of cotton fabric on one side – and this ensures there is no discomfort caused while sleeping. The only instance you don’t need to have a mattress protector is when you don’t have a mattress in the first place. Otherwise, a mattress protector is a must. Pick your favorite from the list and see your life change for the better! Also, do let us know how this post has helped you. Comment in the box below. dont we have any mattress protectors manufactured by kurlon?? I bought the Trance Home Linen waterproof protector last week. When I got it delivered, I put it on my bed and the first I did was to pour some water on it. It soaked the water very well. I poured a little more water .. the best part was it didn’t soak my bed. Great product I should say! Does what it claims.